Standing next to Cecil Hulsey at the reception is Angie Hahn holding a special photo taken early in World War II when Cecil and Angie's father, Henry Banister, and Cecil's brother, Willis, were going for an interview at the Draft Board. Both Willis and Henry were turned down by the Board but Cecil was accepted and he went on to serve in the Army Air Force as an officer on a B-24 Bomber which completed a number of missions against the Japanese home islands. In the photo Cecil is seen at the bottom right and Henry is at the top. 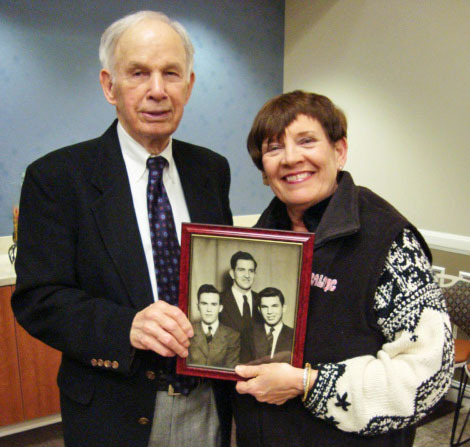 ​January 22 -- Community leaders and a host of friends gathered yesterday at a reception at the Farmington Public Library to honor Cecil Hulsey, a much admired businessman, who had been in business here for almost 70 years. Old timers in town will remember him when he opened the Hulsey Insurance Agency in part of the building then also being occupied by the Missouri Natural Gas Co. at the end of World War II. Later he moved into real estate as owner and operator of the local Coldwell Banker Agency. At the reception yesterday at the Sarah Barton Murphy Room in the library for Hulsey and his wife Jean, the large crowd of well wishers included State Senator Gary Romine and State Representative Kevin Engler who presented Hulsey with two separate proclamations from the state legislature honoring Hulsey's work in the community. Hulsey was a veteran of World War II where he served as an officer with the crew on a B-29 heavy bomber over the Japanese home islands.